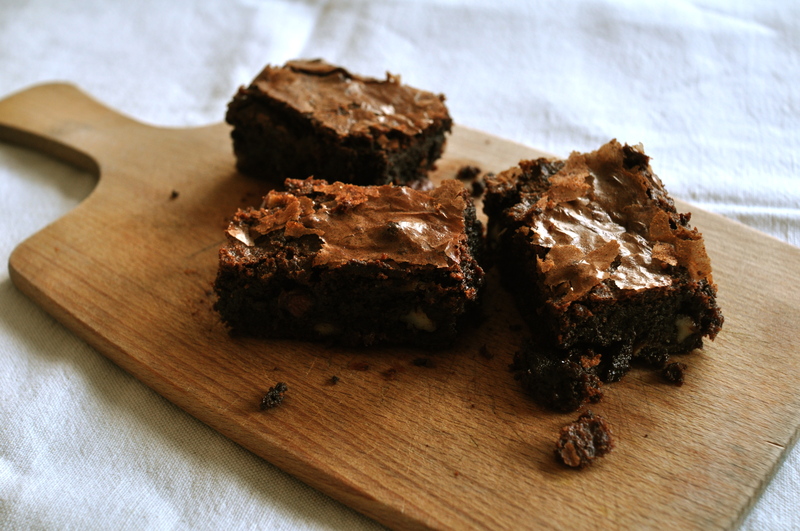 Nigel Slater’s brownie recipe is, in his words, “just a 24-carat brownie, as dense and fudgy as Glastonbury Festival mud.” Who could resist? I, for one, couldn’t. Though I rarely make chocolate dessert — a whole year might go by — and never choose the chocolate option on a restaurant menu. It’s not, as I sometimes explain for simplicity’s sake, because I don’t like it much. 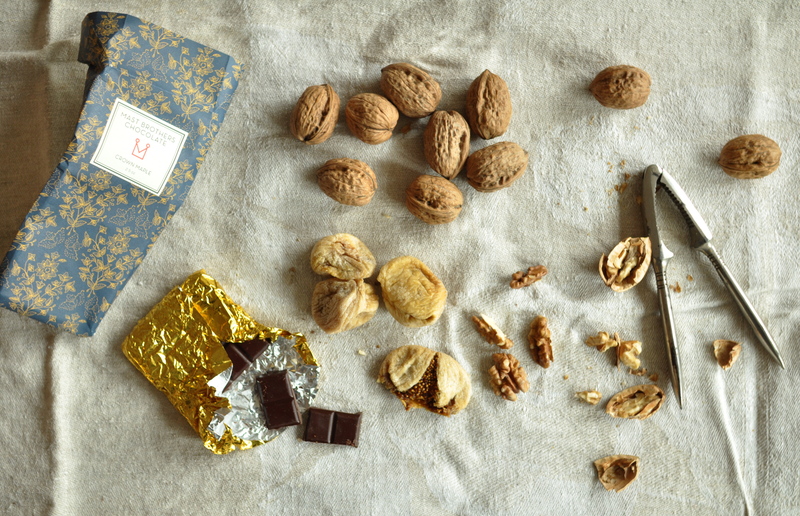 The truth is that, in matters of chocolate, I am embarrassingly picky. While most fruity cakes, tarts, and crumbles make me happy, chocolate doesn’t often hit the mark. It’s not as simple as dark or milk, cake or mousse, it’s a subtle dance in proportions: the shade, the butter, the nuts; it’s entirely subjective. For me, the perfect chocolate confection lies somewhere between a pecan blondie and a sombre, flour-less, nutty chocolate cake. Which swept me right into the lap of this deep dark, spot-on fudgy brownie. It could be the only chocolate dessert I make all year. I substituted “60 g of finest-quality cocoa powder” with an equal amount of additional regular chocolate (and so reduced the sugar very slightly). I also added pecans, of course. Take the butter out of the refrigerator to soften at room temperature. Preheat oven to 350°F (180°C). Line a baking tin, approximately 9″ (23 cm) square, with parchment paper. Butter the paper and the sides of the pan. Prepare a pan of simmering water. 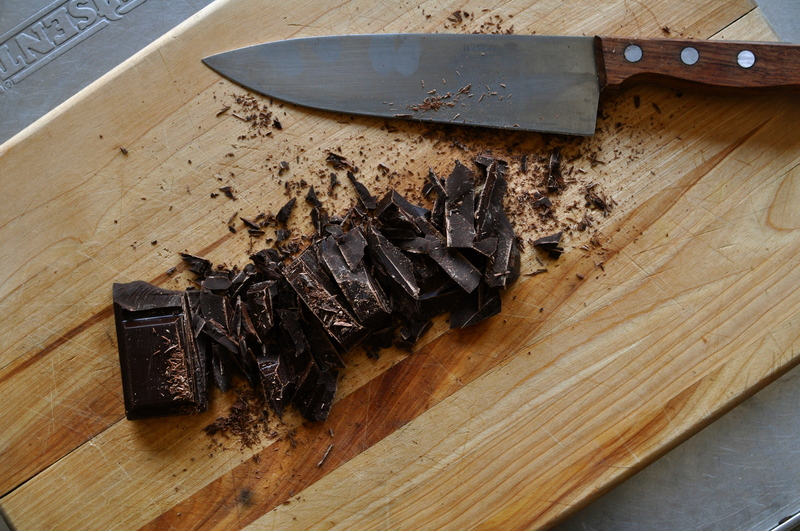 Break the chocolate into pieces and set aside about 2 ounces (50 g). Melt the chocolate (except the 2 ounces) in a bowl sitting atop, but not in, the simmering water. Once melted, remove the chocolate from the heat and set aside to cool. Chop the remaining 2 ounces of chocolate into chip size pieces. In a large bowl, beat the sugar and softened butter thoroughly, until very light and creamy. Break the eggs into a small bowl and whisk briefly with a spoon. Add the eggs to the sugar/butter mixture, little by little, stirring thoroughly in between. Add the melted and the chopped chocolate. Mix in the flour sifted together with the baking powder and a pinch of salt. Do not overstir, stop as soon as all the flour has disappeared. Finally fold in the pecans, carefully with as few large strokes as possible. Let cool for at least an hour before cutting.